Jeweler is a free Bootstrap admin dashboard template. Bar, Line, Area, Rounded, C3, Sparkline, and Peity Charts are representing the analytics. Jeweler has advanced interface elements like Google map, data map, Pdf viewer, x-editable, tree view, text editor and preloader. Free Bootstrap admin dashboard template for an e-commerce website, admin panel, control panel or web app dashboard. It is a fully responsive and well-designed theme with three different versions of dashboards. Moreover, Bar, Line, Area, Rounded, C3, Sparkline, and Peity Charts are representing the analytics. Jeweler has advanced interface elements like Google map, data map, Pdf viewer, x-editable, tree view, text editor and preloader. Besides, the box is filled with tech-savvy features like datatables, password meter, dual list box, multi-upload and then some. Jeweler is an easily customizable theme and contains well-organized and well-commented code structure to make crafting with it easy. Create with Jeweler and make your project a modern and stunning one. Thank you for downloading Jeweler. 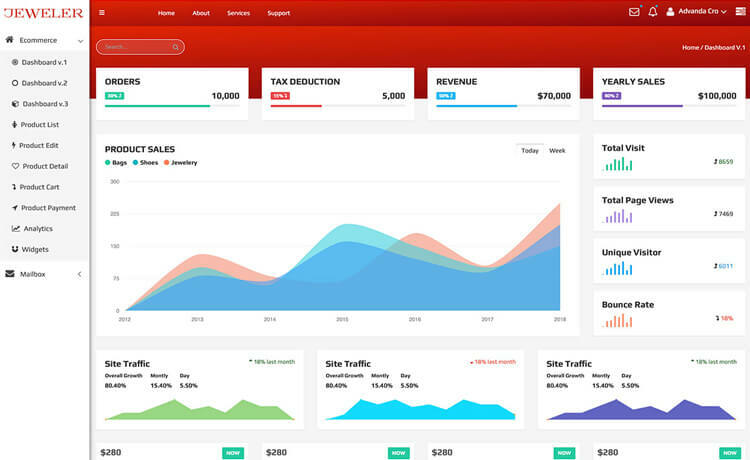 Here are three recommended free Bootstrap admin dashboard templates for you.